This low-energy renovation project will be realized in stages. The programme and building arrangement will not be modified. In the first stage the roof was insulated and altered in view of the insulation of the front facade in a later stage. 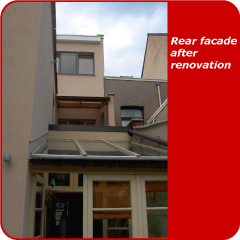 The rear and side facade were insulated and plastered. Because of the favourable interior climate, the installation of balance ventilation was not taken into consideration. No changes were made during the renovation. A geyser (gas water heater) was installed. The wet rooms were positioned on top of each other to reduce water piping length. The owners intend to provide a 22m² solar panel installation. Passiefhuis-Platform vzw  Plate-forme Maison Passive asbl, Architecture et Climat  UCL, BBRI..